An all-American classic country-style breaded steak turns Japanese and merges with a traditional Katsu style cutlet from Field Roast! 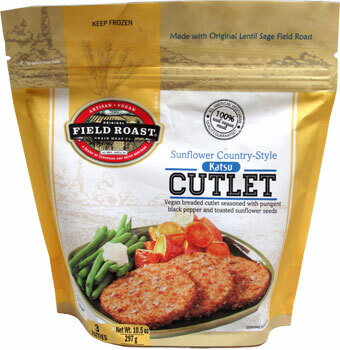 They start with a sliced steak of their Original Lentil Sage Field Roast, which is battered and breaded in a special recipe of seasonings, breadcrumbs and sunflower seeds to make a truly unique vegan entree. Ready in 15 minutes in the oven, 5 minutes on the stovetop, or 2 minutes in your microwave, these cutlets are ready in a hurry for dinner! 10.5 oz. (297g) package contains 3 Katsu Cutlets. $7.99 per package. From tbowie3 of Columbia, Maryland on 2/10/2019 . These were such a pleasant surprise! I am so glad that I took a chance and purchased them! I love the thickness of the cutlet. It goes well with mixed vegetables and a bar-b-q sauce. I am definitely putting these in my weekly rotation! From Richard Rankin of La Plata, Missouri on 11/14/2017 . I had no idea what a Katsu Cutlet was, but ordered a pack anyways. I prepared some in an air fryer instead of the oven, and these are really a step above your normal veggie burger. I had mine 'Hawaiian Style' which is sliced and then eaten with Mongolian BBQ sauce. Terrific!